This course concerns (a) immediate settlements, (b) long-term settlements, (c) rate of settlement, (d) criteria for tolerable settlement, (e) methods of reducing or accelerating settlements for saturated fine-grained soils and (f) methods for controlling and/or estimating heave in swelling soils. Procedures given are for fine-grained compressible soils as well as for coarse-grained soils. The settlement of saturated cohesive soil consists of the sum of three components; (1) immediate settlement occurring as the load is applied, (2) consolidation settlement occurring gradually as excess pore pressures generated by loads are dissipated, and (3) secondary compression essentially controlled by the composition and structure of the soil skeleton. The settlement of coarse-grained granular soils subjected to foundation loads occurs primarily from the compression of the soil skeleton due to rearrangement of particles. The permeability of coarse-grained soil is large enough to justify the assumption of immediate excess pore pressure dissipation upon application of load. 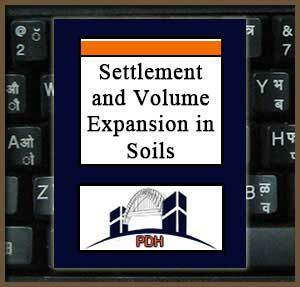 Settlement of coarse-grained soil can also be induced by vibratory ground motion due to earthquakes, blasting or machinery, or by soaking and submergence. Learn how the typical loading cycle during building construction may cause swell and heave during foundation excavation, followed by application of the structural load which recompresses subsoil and may extend consolidation into the virgin range. Learn how to use pressure-void ratio diagrams. Learn how to correct settlement calculations for overconsolidated clays that may give an overestimate of the settlement. Learn the relationship between the Settlement Ratio and the Overconsolidation Ratio. Learn about the time rate of primary consolidation.. This course is intended for civil engineers, structural engineers, geotechnical engineers, geologists and other design and construction professionals wanting an introduction to methods and techniques for analyzing and designing for soil settlement and expansion for foundations and footings for buildings and structures. This course will give engineers and other design and construction professionals an introduction to soil expansion and settlement for structure foundations. This is an introduction to methods, techniques and equipment for analyzing and designing for soil expansion and settlement for structure foundations. This course will give you an introduction to methods and techniques for estimating soil settlement and expansion when designing footings and foundations for buildings and other structures.